Do you suffer from this error message " File or directory is corrupted and unreadable " in windows xp or windows 7 .You can't access to your usb flash drive or your hard disk partitions.Here is the solution .Try it now and fix your problem. Hello my friends , today i bring the solution of File or directory is corrupted and unreadable error message .I know this message bother you because sometimes you want to open your usb flash drive or your external hard disk and you got this message .If you want to fix this problem follow this tutorial .A friend of me "MR : Zohir Taha " that own "Taha soft forum " developed an easy tool to overcome this problem . Download the program then open it .Write the drive label then press enter.Wait until finish repairing your usb flash drive or hard disk partition . please if you have a question tell me ,feel free to contact me in any time .. 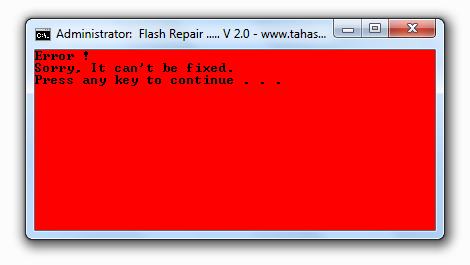 I have not managed to fix the flash, same problem above but why can not be repaired. message appears as red in the image above. is there another solution? Thank God for you!If not for you,many years of photography work would have been lost! My 1TB LG external hard drive was brought back to life through this little "magical" software-no file was lost! I don't understand what to do? 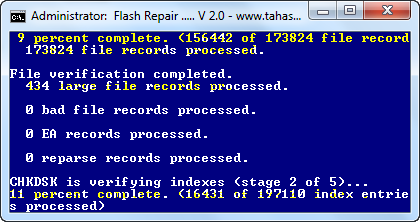 please tell me a simple way to repair my Toshiba external 500gb hard disk..
Nice Software bro..thanks a lot.. Thanks for your such an informative and lovely blog. I really appreciate you.I could get lot more knowledge from your article.. thanks for sharing. Mr muhammed you and your friend mr taha are trully geniuses. How this is the only place in internet that do not says "just format the card"? Now, whats the magic behind this masterpiece of software? downloaded file not working. please provide me a link. i have used this software and successfully formated my sd card..
but when i eject the card and then reinsert it the deleted files reappears. Hi, I tried your program but it cant be fix. From the Disk Management the my drive status is Healthy. Please help if you have any suggestions how can i fix my drive. Thanks! I have the same problem. I have a 1TB seagate external hard drive. some files open and some not. I downloaded the program, but the program stops a 10%. Can you help? the files are very important!! i cant open the software.. is it still available? Thanks! well its still processing... and it showing the estimated time depends on how big the file is... i got 800gb i think.. more than 26,000 files... im in 1,346 but.. im hoping it will work! THANK YOU! IT WORKS!!! THANK YOU SOOOOO MUCH! sir i have 64gb samsung microsd card which show D:/is not accesible,the file or directory is corrupted and unreadable. Flash repair 2.0 worked very well and my Kingston 64GB pendrive recovered fully. Thanks a ton.